The trials and tribulations of travel start the moment you leave your home. From bad weather to forgotten items, it is a challenge to get out of your home and to the airport. Getting to the airport on time is a feat all on its own, but parking at the airport should come with its own playbook. As a travel pro, there are things I make sure of. 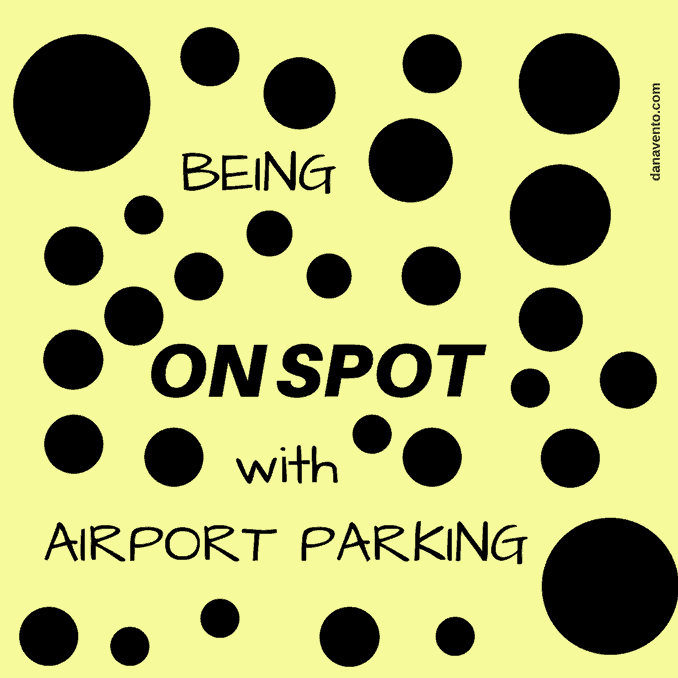 For one thing, being On spot with airport parking is critical to the days’ challenges. How do I get to the airport and not break a sweat? What do I do about airport parking? Being on spot with airport parking is how I lavishly live travel out loud, every time I get ready to head to the Pittsburgh airport! Today’s post is sponsored. As a brand partner of The Parking Spot, I can offer you insider’s tips and knowledge to help you in being spot on with airport parking! Here is my traveling buddy SPOT. Whenever I pack up to travel SPOT is with me. You see, Spot’s dad works in airports all around you. Mini Spot travels with me, each time I visit The Parking Spot because he wants to see his dad. In fact, meet Spot’s Dad! I see him often, and so do you. Spot’s Dad is always busy working helping travelers get from their airport locations to The Parking Spot (covered) Garage. Spot is ready to adventure around the world with me, and he will often be on my Instagram, so make sure you follow along. Follow the hashtag #AdventuresWithSpot to see where he is and comment! How Am I On Spot With Parking? First and foremost, I never park anywhere else but at The Parking Spot. My car deserves to be covered and The Parking Spot is all covered parking. My spot is what I reserve, I am ‘spot -on’ guaranteed my parking once I make an easy reservation. Second, I am a member of The Spot Club™ that keeps me saving as I travel. I am a ‘frequent parker’! It’s free so I am ‘spot on’ with budgeting! Third, I heart The Parking Spot drivers. I pull in, park and here comes my shuttle. The driver takes my luggage from the ground to the shuttle and gives me a tag (that will be used when I get back to the shuttle). At the airport, the driver lets me get off first, then he gets my luggage (make sure to tip these guys, they work hard and often really early or really late!). Last, I’m on spot with parking when I get back to Pittsburgh because my app (oh did I tell you to download it? DO!) tracks my arrival and the driver is on his way. I head to the ground transportation and I see Spot’s Dad and away we go. My car is not wet, not snow covered, just ready and waiting for me! It’s easy, convenient and makes travel so effortless. I appreciate the help with my bags and coming back to a car that is not flooded or snowed on! Travel is about being on spot with parking and spot on about the parking arrangements you use. Remember to follow me and ‘Mini Spot’ for #AdventuresOfSpot & Dana:) — Find The Parking Spot Location by you and make those parking arrangements. On spot sounds amazing. these guys do work hard and to have such a high review really shows the company’s standard. glad to hear about spot. The Parking spot should be an exciting place. I love your tip. I will surely try it when next I have to park at the airport. The services rendered at The parking spot is great, I like the fact that The parking spot drivers are courteous, the take ones luggage from the ground shuttle and give it a tag and at the air-port one get off first which will be followed by one’s luggage.Great services from The parking spot. I thought of a real parking space lol. You had me there. Anyway that bus looks like it came from 101 Dalmatians. That is cool. This service is amazing and no doubt advantageous. I am sure to try this. This must be exciting. This will definitely work on spacious airports. This could help the resolve traffic within airport arrival area. This service sounds convenient. Thanks for sharing! Sounds like fun! Sure everyone will benefit from it. It’s hard to get a parking space in the airport which is always congested. wow sounds like such an amazing idea and service. I’ll love to try it!! Lol this is so dope! I’m glad the airports are enhancing their service to integrate the use of modern technology. I’m excited to give this a try! This sounds like such an amazing idea and service. Having your car ready, without any snow, or being wet, or with dust, just ready for me to drive home, what can someone traveling back to home need. I will sure check your Instagram for more adventures with spot. I think it’s safe to say Spot is rather adorable and the service is rather useful. I’m thankful for anything that makes travelling a little easer. This sounds like such a big help…i always struggle with finding the right parking at airports and this is godsent for people like me who go for short day trips! Do not struggle, I do hope you have The Parking Spot in your area. What a great service! Definitely must take the stress out of parking at the airport! Is it available in Canada too? No it is USA based. Wow, I didn’t know about Parking spot at all. I am always on the road but from home to airport is always on taxi. I hope Parking Spot coming to Singapore very soon!! I’ve seen spot before but never thought to use. Now that I’ve read your review, I’ll have to give it a try. I have never used this service, but it sounds like it would be great for frequent travelers. I love loyalty programs and never thought about one for parking, but it’s a great idea! I’ll be looking at this for my area. Wow, this is actually a great idea, if you travel alot. I need to check out, if I got something similar in my city. This is where I park when I travel. I seriously haven’t had a better experience with others as I have had with them. Nice post! I like it and also share it with others. You can also book cheap airport parking cand save a huge amount of money. Compare airport parking deals is optional for you to save extra money. Have a safe journey! This sounds like a great concept, I like that its all covered so your car isnt exposed to the elements. The Parking Spot sounds like a really reliable and thorough service! This is a GENIUS service!!! I don’t fly all that often but my dad flies all the time so I’m definitely going to let him know about this! !